The age-old problem of having content locked in a computer still annoys many of you out there. Some of your best media is stored on the computer, but you want to view it on that nice big HD screen you just bought without having to put a noisy PC in the main living space or having a go at balancing your laptop on the windowsill. If you’re one of these people, then the solution might be to invest in a media extender for the living room. 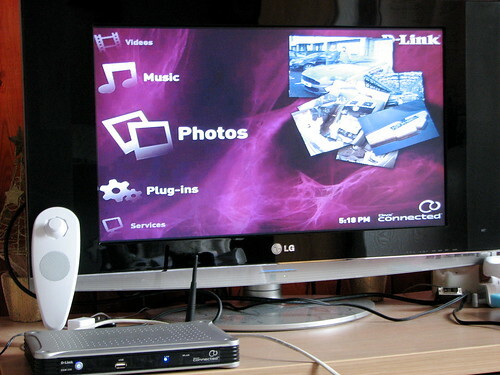 These devices allow you to stream content from a machine nearby straight to your television set. 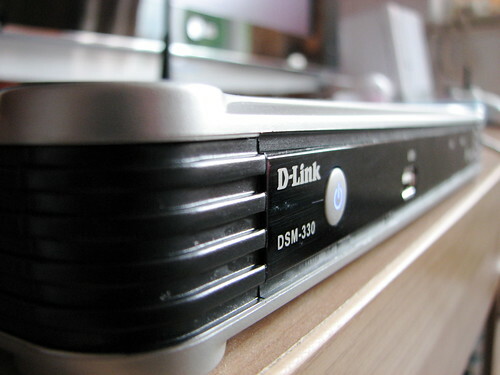 The DLINK DSM-330 allows you to do this through a wireless or wired connection. It’s setup to work with any television set using HDMI, composite, scart or S-Video and your home theatre system using RCA audio, coax optical or SPDF. This makes the 330 suitable for streaming your homemade videos and photos as well as HD content. 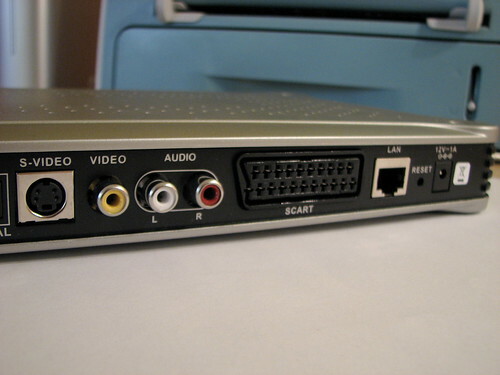 The DSM-330 is HD-ready straight out of the box, supporting up to 720p resolution and has a built-in 802.11g wireless networking card and 100MB Ethernet card for streaming content from the computer. 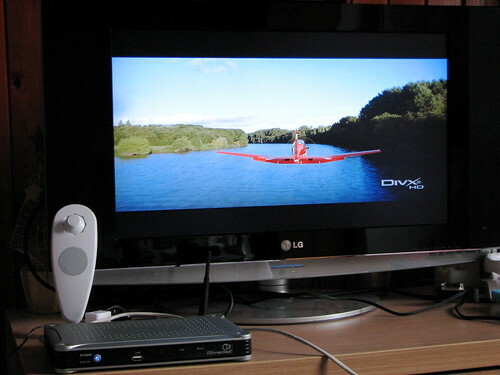 To get content from your computer to your television set, you need to install the Divx Connected software (available only for Windows), which will enable the relevant ports and manage the directories shared. I did have a few issues with the software crashing on my Vista machine, however the problems were resolved when I downloaded the software update. With a small footprint and fan-less design, the DSM-330 makes no noise during or before operation, making it ideal for any living space. The remote control gives you complete access to the box with full playback functionality as well as shortcuts for instant access to your media. Getting setup quickly is a key selling point for the DSM-330. The box plugs straight in to your television set, power it up and a setup wizard takes you through the configuration to get access to the network and your screen settings. After that, you’re greeted with the home screen. The simple select and click interface allows for quick access to your shared content. Thumbnails are provided for videos and pictures so you can easily identify what’s contained in the file. At first, things start to appear quite slowly, however if you know which file you’re after, you don’t have to wait for the thumbnails to stream. What I found impressive is how quickly high definition videos start streaming, with a near-instant start. 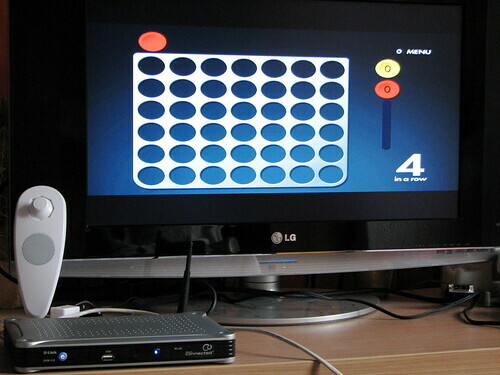 DLINK have tried to tie in online functionality to expand functionality via plug-ins and online video streaming. Unfortunately, they haven’t really got this part right. Right before I started testing the DSM-330, Divx decommissioned the Stage6 online video service. This renders the shortcut key and the on-screen menu for accessing Stage6 completely useless. Since DLINK have decided to partner up with DLINK on this box, there’s no alternative video service that will work with this box by default. Fortunately, and if you’re smart enough to figure out how it works, DLINK do allow plug-ins to be installed in to this box. However, I wasn’t able to figure out how this worked, even after visiting the web site. To sum it up, if you’re looking for a wireless media extender for your high definition TV set, then the DSM-330 does a good job. What really irritates me is that it’s a Divx device, and whilst I love what these guys have done, it renders this box nearly useless for most people. Had the Stage6 service remained open and had compelling content, then this would have made this box a ‘maybe’ device. Restricting content to only the Divx format, forcing users to re-code content will not only immensely annoy many people, it will probably put them off buying it in the first place.